Our cities are comprised of people of all migration statuses who contribute to community. Limiting access to services based on migration status creates a fundamentally unjust system in which sections of our community are excluded, exploited, and denied access to their basic human rights. In recent years increasingly exclusionary immigration policies have been introduced creating a state of fear. People are being denied access to basic services such as health care and are left vulnerable to abuse and exploitation. People are being treated as disposable economic commodities rather than human beings. Honouring the land and actions of the First Nations that have lived on this land since time immemorial, we want to build communities that are in solidarity with Indigenous land defenders on Turtle Island and with global movements against dispossession. 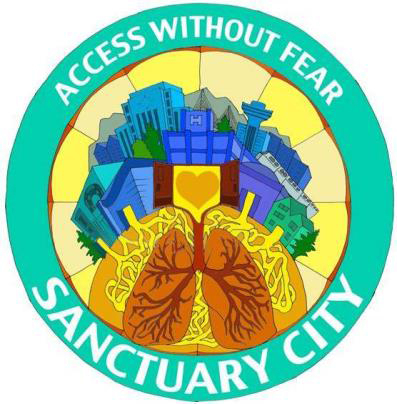 As part of the growing Sanctuary and Solidarity City movements across North America/Turtle Island we seek to collaborate with communities and service providers to create safer access to services for all people based on need rather than status. Workplaces, service providers and community and faith-based groups can endorse our principles and commit to working towards them. Endorsements can be sent to sanctuaryhealthvancouver@gmail.com.